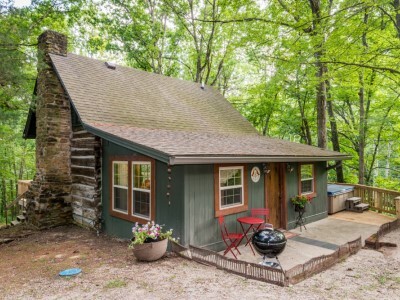 This delightfully cozy two bedroom (4-person) historic log cabin is just a “hop, skip and jump” from downtown Nashville, yet has a private setting perched high on a 2-acre wooded lot overlooking a creek. Both the huge front deck and the back hot tub deck provide tree house like views. The owner’s joy of antiques and fun “quirky uniques” shows through in this beautifully decorated cabin that was totally renovated in winter 2016. Both the main floor and upstairs bedrooms have queen beds and on suite bathrooms. The kitchen and dining room features rustic beams and opens up to the living room with a fireplace (gas logs) and a large bank of windows providing lots of sunlight and wonderful views. The location is extra special in that it is only a half mile out of town! On a pretty day you’ll enjoy the short walk down a quaint county road to take advantage of shopping, dining and live entertainment that Nashville provides. You’ll be part of nature in the private setting which is perched on a small bluff overlooking a babbling creek. The two decks take full advantage of this beautiful setting. The back deck’s hot tub provides a relaxing setting to soak up the views. There is a grill off the back patio and a camp fire pit for sharing stories and creating new Brown County memories. Over Easy: Our 4BR Sister Cabin. Maple Hills: Our 3BR Sister Cabin.